Dowagiac is a small town in Cass County, Michigan in the southwest corner of the state. Located about 25 miles north of South Bend, Indiana, 90 miles east of Chicago, Illinois, and 45 miles southwest of Kalamazoo, Michigan, Dowagiac is perhaps best known as the home of the Round Oak Stove Company, a leading manufacturer of heating stoves in the late 1800’s and early 1900’s. In my family, Dowagiac plays a brief but important role. After immigrating to the United States from Poland in 1909, Stanislaus (Stanley) Piotrowski settled in Chicago for a short time before relocating to Gary, Indiana. A butcher by trade, Stanley later married Wladyslawa (Winifred) Tobolska in April 1915 at St. Hedwig Church in Gary. Ten months later, a daughter, Stella, was born. A second son, Francis John, was born in August 1918, and a few weeks later, Stanley registered for the World War I draft, listing the 201 Lagrange Street address as his residence. 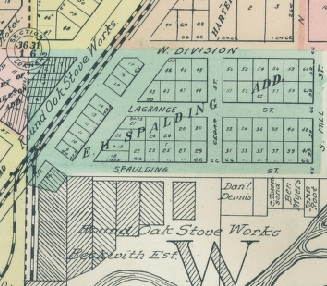 Here is a closeup image of the Lagrange Street area, as shown in the 1914 Standard Atlas of Cass County, Michigan. Lagrange St., Dowagiac, from the 1914 Standard Atlas of Cass County, Michigan. The Piotrowski house is located at the northeast corner of Cedar and Lagrange, Lot 51. Note how close the Round Oak Stove property is to the south. Today, the Lagrange Street property is a vacant lot. By 1921, the Piotrowski’s had moved to Kalamazoo, Michigan, where they remained for many years. Although Stanley’s time in Dowagiac was brief, no more than 5 of his 87 years were spent there, it was an important interlude for his family’s 50-year story yet to play in Kalamazoo. The Dowagiac interlude saw the birth of two sons, the death of one, a draft registration, and a businessman establish himself in the local community. Perhaps that qualifies as an act all its own.